I have great news!!! I am staying at GingerScraps.net and Snapclicksupply. I am having a Grand Opening sale at GingerScraps.net!! My shop will be on sale 50% off April 1-7th!!! BUT if you shop on April 1st you get a bonus 15%off–it’s NO JOKE!!! It’s going to be a great week!!! Celebrate with me!! I had a lot of fun creating this Thank You card for the Simon Says Stamp Wednesday Challenge. The theme was Thanks/Thanksgiving. For this card I used a stamp set from this months card kit at Simon Says Stamp–Thanks and Leaves. I used distress oxide inks in–fired brick,spiced marmalade, peeled paint and walnut stain. The sentiment was also from this Stamp set and stamped in versions onyx black ink. I added a few drops of Nuvo crystal drops around and some summer gold sequins from Simon Says Stamp. I have added Paws-itively Dog to my shop at Snapclicksupply.com this week. And through the weekend the full kit and the individual parts are on sale 25% off!!!! You can pick up just the elements, papers or alpha if you choose. I hope you enjoy this kit. I have a new collection in the shop this week and everything in my Sodalicious collection is 25% off through Sunday!!!! This collection was inspired by the new soda and specialty drink shops that have been popping up in my neck of the woods. Dirty drinks and super fun drinks that are served at these shops are a family favorite and is a hot spot for the local teen scene around here too. So, of course I had to try to create a kit that I could document the moments and trips to these fun shops!!! 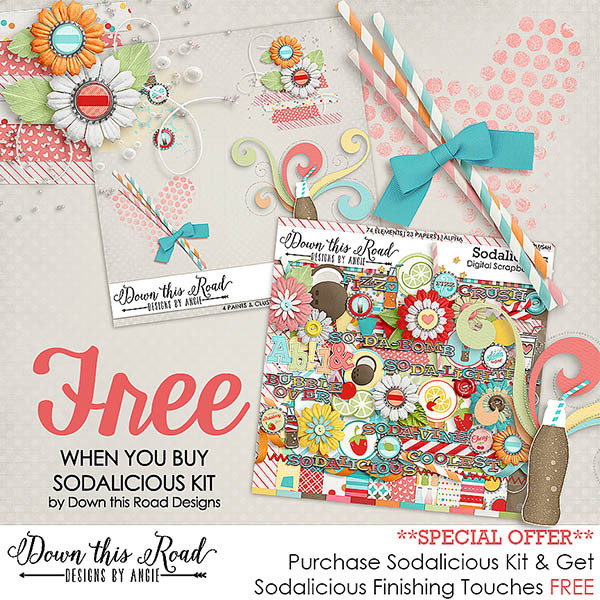 Sodalicious kit-this kit includes 74 elements, 23 papers and 1 alpha in 5 colors!!! I have a FREE WITH PURCHASE OFFER THROUGH THE WEEKEND TOO!!! **just add the kit to your cart and the finishing touches will automatically be added for free. If you add the finishing touches to your cart you will be charged for them…..so just add the kit!!! I also have the collection available in a complete collection!!! Just $7.50 for the entire collection through the weekend!!!! I have a few re-release templates that are new in the shop this week as well and they are all 25% off through the weekend as well.